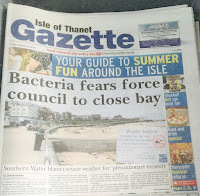 Thanet Life: Safe to Swim Now! 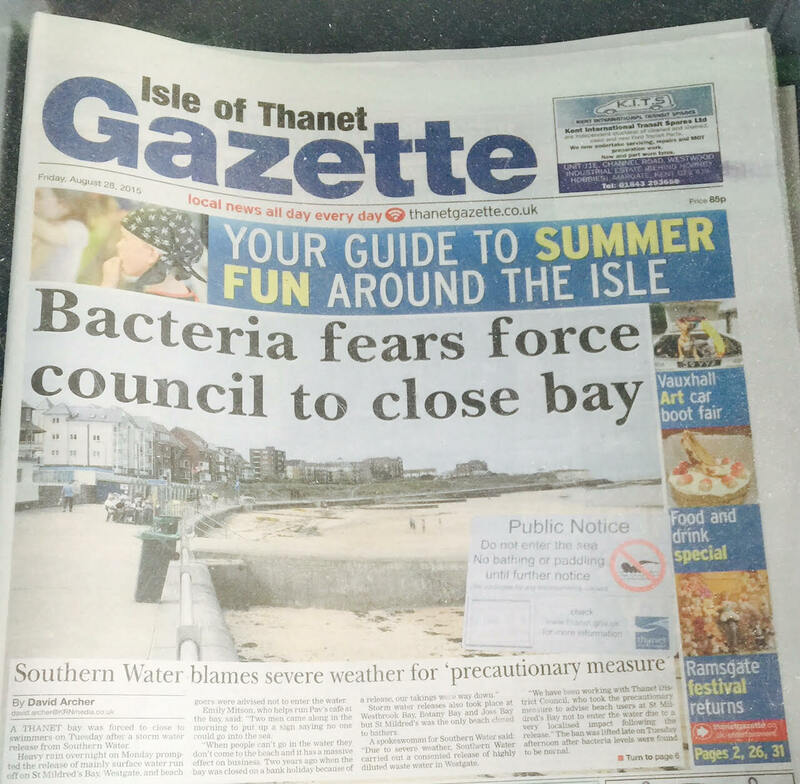 This week I alerted people on Twitter (@SimonMoores) that the St Mildred's Bay beach in Westgate, had been closed after a bacteria alert; all following-on from the heavy rainfall. 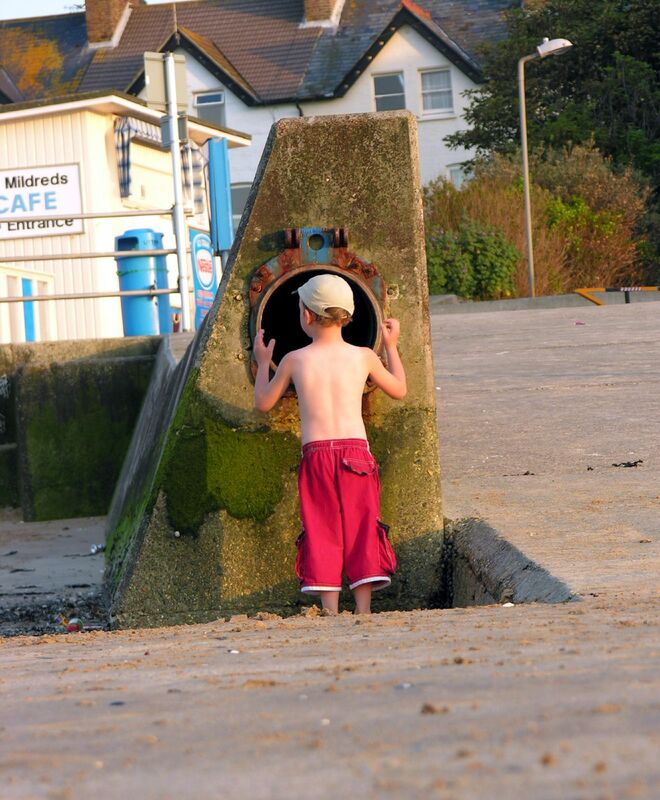 There's a drain discharge which runs straight-out on to the beach as you can see pictured with the small boy in the photo! The local paper picked-up the story on its front page today but I wanted to illustrate how a new generation of drones will, like Blogs and Twitter, prove disruptive in news reporting locally, very soon I'm sure! Here's my own video of the bay, this Friday morning, as it's now safe to swim and enjoy our wonderful beaches here in Thanet. Interesting point. But Thanet blogging has pretty much had its day. I wish I had a quid for every time Michael Child begins a sentence "I guess" of late. Nationally Blogger Spivey has been given a suspended sentence. A blog on the child sexual abuse revelations has used a blog identity to make over 200 FOI applications. The civil servants responding have to give their names but are in fact replying to an internet identity. It may only be a question of time before the trend to influence without consequence is curtailed by law. However the inexorable progress of concerns, that all Thanet blogs declared "Conspiracy theory", continues. The IPCC decided to refer the concerns to lead investigator in what is thought to be Neville Lawrence complaint against Lord Stevens. A former TDC Labour cllr confirmed that he called Met anti terrorist branch to make inquiries in Thanet in 1998 the year of Neville's complaint. Some of these same concerns have passed submission admissibility to child sexual abuse inquiry. I am pleased to see you act re sewage overspill. Next you may think about how mercury deposits got on Palm Bay beaches ? Thor surely was only tipping remediated waste direct to drains ?